HowToSimplified Toolbar is a browser plugin which promises to provide “the best how-to advice.” When you install this toolbar, it will become visible on your browsers no matter which one you use. Actually, a toolbar will not be the only thing you notice. It also sets its own homepage, default search engine, and the New Tab page to improve the user’s web browsing experience and the functionality of browsers. Unfortunately, it is not exactly true. Yes, you will see a toolbar at the top with buttons leading to third-party websites but you can open them without the help of HowToSimplified Toolbar too. Also, it has been found that users who use the search tool set by HowToSimplified Toolbar risk infecting their browsers with malicious software. This is one of the reasons you should go to implement the HowToSimplified Toolbar removal right now. Potentially unwanted programs like HowToSimplified Toolbar are not very harmful themselves, but they might still pose a danger to the computer, so keeping them installed is not advisable. What does HowToSimplified Toolbar do? When HowToSimplified Toolbar is downloaded and installed either from its official website or from some kind of other source, it sets a toolbar at the top of every browser. Also, you will see a new homepage, default search tool, and the New Tab page. Since users see the website of HowToSimplified Toolbar every day, they decide to use the search tool of HowToSimplified Toolbar to search the web. It is a bad idea because its search results might contain advertisements and links leading to third-party websites promoting bad applications and even malicious software. 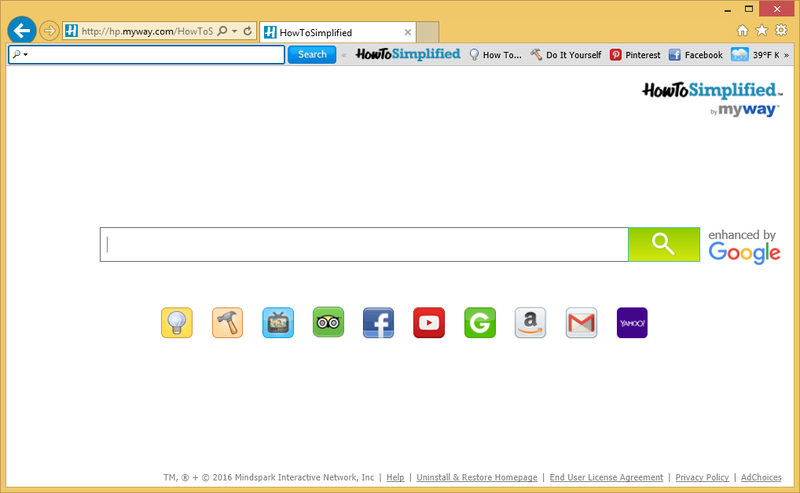 Of course, you should go to uninstall HowToSimplified Toolbar not only because of that. It has also been found that HowToSimplified Toolbar itself and the websites promoted by it might also be dangerous in a sense that they gather data about users. This data might be personal too, so you should stop the activities of HowToSimplified Toolbar until it is not too late. You can do that by implementing the HowToSimplified Toolbar removal from the system. How is HowToSimplified Toolbar distributed? There is an active homepage HowToSimplified Toolbar can be downloaded from, but, judging from complaints users make, it might be spread in a different way too. For example, it might arrive bundled with freeware too. Users often get this freeware from untrustworthy third-party websites they find on the web. Always carefully go through the information provided for you when installing new software. This might help you to notice additional programs that are going to be installed and thus disable the setup of undesirable software. How can I delete HowToSimplified Toolbar? HowToSimplified Toolbar not only sets a toolbar, but also places its own page on browsers, so it is not very easy to remove HowToSimplified Toolbar in a manual way. Fortunately, you can go to remove HowToSimplified Toolbar automatically. You need to acquire a trustworthy scanner to delete HowToSimplified Toolbar in an automatic way, so go to get one before taking any action.